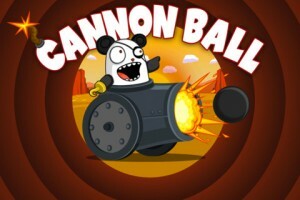 Cannon Ball iPhone Game Review. With the release of iOS5, my Updates tab on my iPad fills up every day. Every app is currently updating to add even the most basic support for the new Apple software release for mobile devices. With the literally hundreds of apps that are updating as I write, you can easily miss the ones that are just launching. I almost did! I’m here to rectify that mistake and tell you about Cannon Ball, a recent game release, that’s only compatible with iOS5 and above. 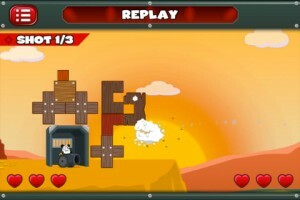 Cannon Ball is a turn-based multiplayer only game available for the iPhone, iPod Touch and iPad with iOS5 installed. The game is playable via Game Center only, so you need a Game Center account to be able to play it, not to mention someone to play it with. If you have no one to play it with, the game uses Game Center’s auto-match feature to match players and pit them against each other in a turn-based shooting action game. The game itself has the basic premises of Angry Birds. 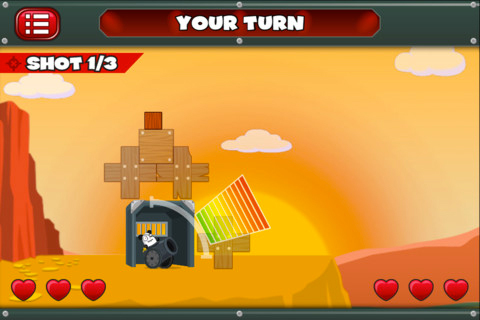 You shoot your canon while taking into account distance from the target, shot power and trajectory. Each player gets three shots each, in turns. Three shots is not much, so make them count. It’s actually not possible to take down the enemy with only three shots. The most accurate I’ve been was to take down the other player with 5. Each player will start with a fortified construction of wood and an enclosed metal compartment where your canon sits. The enemy must first clear the wood to reach the metal compartment and then destroy that. It takes three shots to take the metal compartment apart, and at least two very well aimed shots to clear the wooden blocks around it. First off, you need other players to play against. Once you start a new game in Game Center, you’ll be able to take your three shots, but then you’ll have to wait for the other to take his before continuing. It’s not a great a system unless you have literally thousands of players actively engaged in Cannon Ball. Secondly, there’s no help menu of any kind. You jump right into the game, often you don’t get to start a new game, but rather you jump in someone else’s game and face the three shots he took. And thirdly, once you know how and where to shoot (it should take you no less than 3-4 games to figure it out), it’s just a matter of who takes the first three shots to decide who the winner is. Because the variables don’t change at all (the enemy fort is in the same location, there’s no wind involved, the fort is always the same, the cannon is always the same), once you get the hang of it, it’s not fun anymore. You get to play with friends. Challenge yourselves. It’s actually pretty awesome that I can challenge a friend half-way across the world and introduce him to a world of pain in Cannon Ball, hehe. You can start as many games as you want. While you’re waiting for the other player to take his turn, you can start another game, and another. You can get involved into literally hundreds of games, some of which you’ll start and some of which you’ll jump in as the opponent. Naturally, the more players there are and the more games you start, the more fun you’ll have. Cannon Ball though tends to get repetitive, so I’m hoping that the developers will issue updates to include more features. I’d love to see the ability for players to build their own fort, or choose amongst more cannons that offer competitive advantages in certain conditions. Like different weather or different terrain. Imagine that the weather (wind, snow) will influence your cannon accuracy and that at the beginning you’ll get to chose a cannon, but won’t know how the weather will be like. In short, introducing new variables into Cannon Ball can only benefit players. And, if done right, they won’t kill competitiveness. I’d hate to see canon upgrades or fort upgrades available for experienced players and newbies getting squashed in the auto-match in Game Center. What do you think of Cannon Ball ? Scroll down for our comment section and let us know!